Mansouri, Elham, Majedi, Hamid. (1396). Exploring the Meaning of Quality from Urban Space Users’ Viewpoint by Analyzing Conceptual Environment Codes. معماری و شهرسازی آرمان شهر, 10(20), 63-77. Elham Mansouri; Hamid Majedi. "Exploring the Meaning of Quality from Urban Space Users’ Viewpoint by Analyzing Conceptual Environment Codes". معماری و شهرسازی آرمان شهر, 10, 20, 1396, 63-77. Mansouri, Elham, Majedi, Hamid. (1396). 'Exploring the Meaning of Quality from Urban Space Users’ Viewpoint by Analyzing Conceptual Environment Codes', معماری و شهرسازی آرمان شهر, 10(20), pp. 63-77. Mansouri, Elham, Majedi, Hamid. Exploring the Meaning of Quality from Urban Space Users’ Viewpoint by Analyzing Conceptual Environment Codes. معماری و شهرسازی آرمان شهر, 1396; 10(20): 63-77. 1Ph.D. Candidate of Urban Design, Department of Urbanism, College of Art and Architecture, Science and Research Branch, Islamic Azad University, Tehran, Iran. 2Full Professor in Urban Planning, Department of Urbanism, College of Art and Architecture, Science and Research Branch, Islamic Azad University, Tehran, Iran. meanings defined in perceptual processes. The findings show that space users’ reading is a set of physical, functional, meaning and social layers through meaning guide codes which is more accompanied by reading of physical aspects of an environment.an environment. Appleyard, D. (1979). The Environment as a Social Symbol: Within a Theory of Environmental Action and Perception. Journal of the American Planning Association, 45(2). Berlo, D. (1960). The Process of Communication, New York: Rinehart and Winston. Blumer, H. (1969). Symbolic Interactionism: Perspective and Method. Englewood Cliffe, NJ: Prentice Hall. Canter, D. (1977). The Psychology of Place. London: the Architectural Press. Carmona, Matthew, de Magalhães, Claudio, Hammond, Leo. (2008). Public Space the Management Dimension. Routledge. Carmona, M., & Tiesdell, S. (2007). Urban Design Reader, Oxford: Architectural Press. Carmona, M., Health, T., Oc, T., & Tiesdell, Steve. (2003) Public Places- Urban Spaces. Elsevier. Coleman, J. (1987). Opportunities for Innovation in Urban Design Education, Australian Planners, 25(4), 28-31. Creswell, J.W. (1994). Research Design: Qualitative and Quantitative Approaches. Sage. Creswell, J., & Miller, D. (2000). Determining Validity in Qualitative Inquiry, Theory Into Practice, 39(3). DETR (2000). By Design – Urban Design in the Planning System: Towards Better Practice, London: Department of the Environment, Transport and the Regions. Gibson, J.J. (1979). An Ecological Approach to Visual Perception, Boston, MA: Houghton Miffl in. Gifford, R. (2007) Environmental Psychology: Principles and Practice, (4th ed.). Colville, WA: Optimal Books. Gifford, R., Donald, W., Hine, Werner Muller-Clemm, D’Arcy J. Reynolds, JR. and Kelly T. Shaw, (2000). Deencoding Modern Architecture: A Lens Model Approach for Understanding the Aesthetic Differences of Architects and Laypersons. Environment and Behavior. 32(163). Glaser, B., Strauss, A. (1967). The Discovery of Grounded Theory Strategies for Qualitative Research, New York, Aldine. Goodey, B. (1993), Two Gentlemen in Verona: The Qualities of Urban Design, Streetwise, 4(2), 25-35. Greene, S. (1992). Cityshape, JAPA, 58(2), 177-189. Golkar, K. (2000). 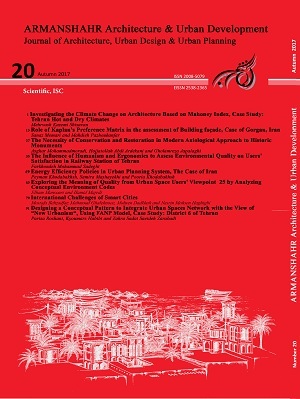 Parameters of Urban Design Quality, Soffeh Journal, 32. Ittelson,W. H. (1976). Some Issues Facing a Theory of Environment and Behavior. In H.M Proshansky, W. H. Ittelson & L. G. Rivlin (Eds. ), Environmental Psychology. New York: Holt, Rinehart & Winston. Kalali, P. Modiry, A. (2012). Explanation of the Meaning in the Process of Formation of the Sense of Place, HONAR-HA-YE-ZIBA, 17(2). Lang, J. (1987). Creating Architectural Theory: The Role of the Behavioral Sciences in Environmental Design. New York: Van Nostrand Reinhold. Lynch, K. (1981). A Theory of Good City Form. Cambridge: MIT Press. Madanipour, A. (1996). Design of Urban Space: an Inquiry into a Socio-spatial Process. West Sussex: John Wiley & Sons Ltd.
Montgomery, J. (1998). Making a city: Urbanity, vitality and Urban Design. Journal of Urban Design, 3(1). Nasar, J. (2011). Environmental Psychology and Urban Design. In T. Banerjee, & A. Loukaitou-Sideris, Companion to Urban Design. New York: Routledge. Nasar, J. (1994). Urban Design Aesthetic- The Evaluative Qualities of Building Exteriors. Environment and Bahavior. 26(3). Nasar, J. L. (1989). Symbolic Meanings of House Styles. Environment and Behavior, 21. Nasar, J. L. (1988). Architectural Symbolism: A Study of House-style Meanings. Paper Presented at the 19th Annual Meeting of the Environmental Design Research Association, Pomona, CA. Nasar, J. L., & Kang, J. (1989). Apost-jury Evaluation: The Ohio State University Design Competition for a Center for the Visual Arts. Environment and Behavior, 21. Nasar, J. L., & Purcell, T. (1990). Beauty and the Beast Extended: Knowledge Structure and Evaluations of Houses by Australian Architects and Non-architects. Paper Presented at the Annual Meetings of the International Association for People-Environment Studies, Ankara, Turkey. Pakzad, J.(2010). An Intellectual History of Urbanism, Armanshahr Press. Pourjafar, M.R. Sadeghi, A.R. & Yousefi, Z. (2009). Recognition of the Impact of Immortality Sense of Place, Case Study: Hooraman Villages of Kurdistan, Journal of Housing and Rural Environment, 28(125). Rapoport, A. (1982). The Meaning of Built Environment, a Nonverbal Communication Approach, Saga Publication. Southworth, M. (1989). Theory and Practice of Contemporary Urban Design, Town Planning Review, 6(4), 369-402. The Prince of Wales. (1989). A Vision of Britain, London: Doubleday. Sternberg, Robert J. (2008). Cognitive Psychology, Fifth Edition, wadsworth. Tibbalds, F. (1984). Urban Design Who Needs It? Place, 1(3). Violich, F. (1983). Urban Reading and the Design of Small Urban Places: The Village of Sutivan, Town Planning Review, 54(1983), 41-62.